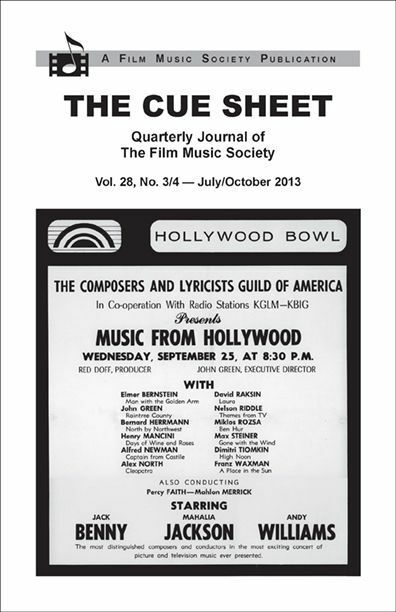 Not so much a book as a journal: The July/October 2013 issue of The Cue Sheet, the quarterly publication of The Film Music Society. Utilizing nearly four dozen never-before-seen photographs, this 64-page booklet goes behind the scenes to tell the previously untold story of the greatest film-music concert in history, Sept. 25, 1963 at the Hollywood Bowl. That night Elmer Bernstein, John Green, Bernard Herrmann, Henry Mancini, Alfred Newman, Alex North, David Raksin, Miklos Rozsa, Dimitri Tiomkin and Franz Waxman conducted their own scores — with Percy Faith conducting Max Steiner and Nelson Riddle conducting a medley of TV themes, plus guest artists Jack Benny, Mahalia Jackson and Andy Williams. 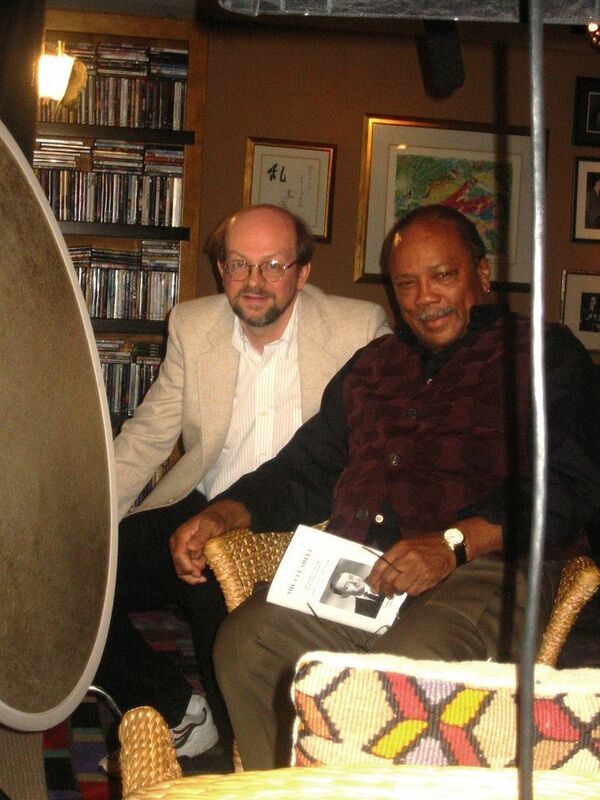 It was the largest-scale public project ever attempted by the Composers and Lyricists Guild of America. (Amateur photographers Raksin, composer of Laura, and Alexander Courage, later the composer of Star Trek, documented the rehearsals.) In addition to the photographs, images of the posters, tickets, even parking passes and newspaper clippings of the reviews, accompany my 9,000-word chronicle of this once-in-a-lifetime event (and its April 1964 sequel, with fewer participants, that was taped for later TV showings). Editor Marilee Bradford — who originally discovered Raksin’s previously unseen Polaroids — did a stunning job of preparing the photos and laying out the issue. Here’s an overview and a link showing how to order it. This entry was posted in Composers, Film Music and tagged Alexander Courage, Composers and Lyricists Guild of America, David Raksin, movie music in concert, Music From Hollywood, Quincy Jones, Stanley Wilson, The Cue Sheet, The Film Music Society on September 23, 1994 by Jon Burlingame.